DAWAY C99 wide bike seat has 7 advantages! Let your riding trip more comfortable and pleasant! Powered by 1 pcs CR2032 battery(Included),battery can be replaced. Offer optimal visibility for safe night riding. Solve the trouble of install taillight. Shedding bright light to your way,no matter what the weather conditions! Don't let rain deter you from your planned ride! Won't rub the inside of the thigh. The best seat design for long-distance riding. Allow you to bumpy or rugged road riding more comfortable. Bring you a healthier & more comfortable riding trip! 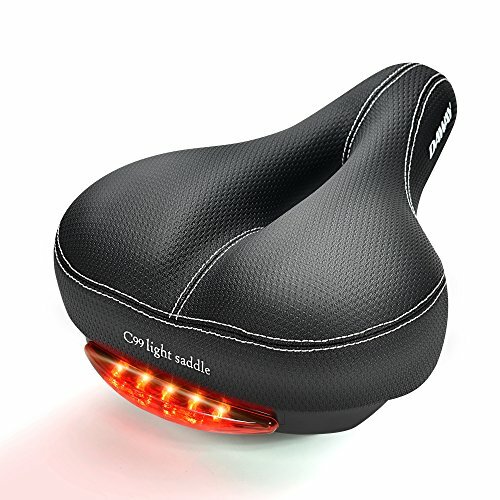 The most comfortable bike seat, perfect gift for cyclists,experience the joy of cycling! QUALITY GUARANTEE, PROFESSIONAL CUSTOMER SERVICE - 1 year warranty! The size of our comfortable wide bicycle seat is 11 x 8.7 inch(L x W) , makes pressure well-dispersed, brings rider great comfort like sitting in soft sofa. We believe you'll love this bike saddle, if don't like or have any problems, pls contact us, 100% refund or replace. This bicycle seat will be a good gift for your lover, families or friends! If you have any questions about this product by DAWAY, contact us by completing and submitting the form below. If you are looking for a specif part number, please include it with your message.